Looking for a quick snack with a fruity twist? Try these graham wafers topped with cream cheese product and your favourite fruit. Spread wafers evenly with cream cheese product. Substitute 12 strawberries, cut into four slices each or 2 bananas, cut into 16 slices each for the kiwi. 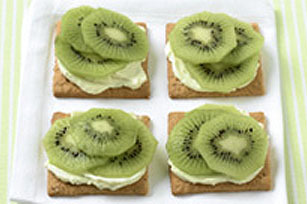 In this simple snack, graham wafers are spread with light cream cheese product, then topped with sliced kiwi. As a bonus, the kiwi provides an excellent source of vitamin C.